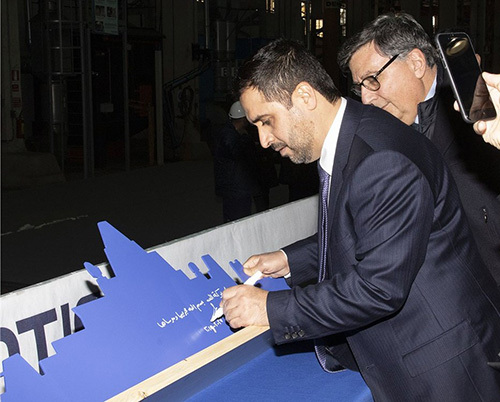 The steel cutting ceremony of the first Offshore Patrol Vessel (OPV) ordered to Fincantieri by the Qatari Ministry of Defense within the national naval acquisition program, took place last Wednesday at the Muggiano (La Spezia) yard in Italy. In the awarding of this prestigious contract, Fincantieri has prevailed over other competitors thanks to a project recognized as the most advanced and innovative of all and an experience gained in the construction of hi-tech vessels. The contract, amounting for Fincantieri to approximately 4 billion Euros, envisages the supply of seven surface vessels, of which four corvettes, one amphibious vessel (LPD - Landing Platform Dock), and two patrol vessels (OPV - Offshore Patrol Vessel) as well as support services in Qatar for further 10 years after the delivery of the vessels. All the units will be entirely built in Fincantieri Italian shipyards. The first patrol vessel, of which the first steel was cut today, is designed consistently with the RINAMIL for Fast Patrol Vessel (FPV) rules and will be a flexible type of ship capable of fulfilling different kinds of tasks, from surveillance to being a fighting vessel. It will be about 63 meters long, 9.2 meters wide, with a maximum speed of 30 knots and will be able to accommodate on board 38 persons of the crew. The propulsion system has four variable pitch propellers, two to starboard and two to the left, each in line with a diesel propulsion engine. Furthermore, the vessel will be capable of operating a RHIB (Rigid Hull Inflatable Boat) through a crane located at the stern. Fincantieri is one of the world’s largest shipbuilding groups and number one for diversification and innovation. It is leader in cruise ship design and construction and a reference player in all high-tech shipbuilding industry sectors, from naval to offshore vessels, from high-complexity special vessels and ferries to mega yachts, as well as in ship repairs and conversions, production of systems and mechanical and electrical component equipment and after-sales services. With over 230 years of history and more than 7,000 vessels built, Fincantieri has always kept its management offices, as well as all the engineering and production skills, in Italy. With over 8,600 employees in Italy and a supplier network that employs nearly 50,000 people, Fincantieri has enhanced a fragmented production capacity over several shipyards into strength, acquiring the widest portfolio of clients and products in the cruise segment. To hold its own in relation to competition and assert itself at global level, Fincantieri has broadened its product portfolio becoming world leader in the sectors in which it operates. With globalization, the Group has around 20 shipyards in 4 continents, over 19,000 employees and is the leading Western shipbuilder. It has among its clients the world’s major cruise operators, the Italian and the US Navy, in addition to several foreign navies, and it is partner of some of the main European defense companies within supranational programs. Fincantieri’s business is widely diversified by end markets, geographical exposure and by client base, with revenue mainly generated from cruise ship, naval and offshore vessel construction. Compared with less diversified players, such diversification allows it to mitigate the effects of any fluctuations in demand on the end markets served. U.S. and Qatari defense officials charted the future of the partnership during discussions in the Pentagon on Tuesday, The U.S.